FULGOR is part of the HELLENIC CABLES Group, which has been a leading manufacturer of cables for more than 60 years. It is the sole producer of cross linked polyethylene (XLPE) insulated high and extra high-voltage underground cables, medium / high-voltage and optical fibre submarine cables, and enamelled wires. The company’s wide product range is sold internationally under the CABLEL trademark, it extends to PVC, EPR and XLPE-insulated power cables, rated up to 500kV, marine and low smoke halogen free cables, fire resistant cables, telecommunication, signal and data cables with copper conductors or optical fibres and includes fire retardant halogen-free plastic and elastomer compounds and enamelled wires. Wires and cables can be supplied to a variety of international standards, including: VDE, CEI, NF, SEN, BS, UL, NEMA, JIS, ASTM, DIN and ELOT. Many of the company’s products are certified from ELOT, BASEC, VDE, IMQ, NF-USE, Network Rail, KEMA, DNV and UL. All CABLEL enamelled wires are manufactured and tested to IEC 60317-0-1; customers may also request any other recognised international standard. Technical know-how from world leaders such as VISCAS Corporation, combines with continual investment in state-of-the-art machinery, to ensure levels of efficiency and quality which meet the strictest standards. The company’s Quality Management System is certified to ISO 9001:2008, its Environmental Management System to ISO 14001:2004, and Health and Safety Management System OHSAS ISO 18001:2007. The company’s commitment to quality and sustainable development principles, has been a key factor in enabling HELLENIC CABLES to establish a strong market position internationally. The company’s highly experienced technical and managerial staff have a strong commitment to technological excellence and outstanding quality, which ensures that the user of CABLEL products has made a dependable choice. FULGOR was established in 1957 and has been a member of the HELLENIC CABLES Group of companies since August 2011. The company strongly contributes to the group’s export orientation and enhances it’s portfolio of high value added products. The company’s manufacturing plant is occupying an area of 220,000m&sup2; by the sea at Soussaki , Corinth, Greece. The company owns a private dock and provides facilities for the direct loading of submarine cables onboard laying or freight vessels. 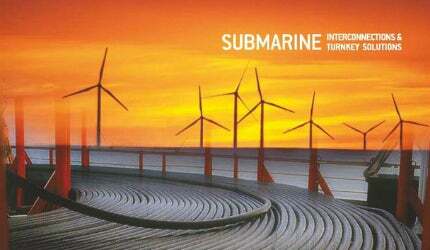 Since 1972, FULGOR S.A. has manufactured more than 980km of submarine power cables with rated voltage up to 33kV. The produced cables are 6kV-33kV, three-core armoured cables with copper or aluminum conductors, insulated with oil impregnated paper tape insulation, lead covered (PILC), XLPE with copper wire screen and laminated core sheath or lead sheath or EPR ‘wet type’ design without a radial metal sheath water barrier. The cables are produced in long continuous lengths due to the development of flexible factory joints. For each cable type the company has developed repair and land-submarine cable transition joints and provides trained personnel for their assembly. In case of long continuous lengths, the cables are loaded directly on board the cable laying or freight vessel through a dedicated loading line. For shorter lengths the cables are wound on drums or coiled in transportable baskets and they are shipped directly to the work site. Since 1992, FULGOR SA has manufactured more than 2,200km of optical fibre submarine cables with varying core structures and types of armouring, while it has installed approximately 1,000km of these cables as a turnkey project contractor for repeaterless links. Currently in production are light weight armoured (LWA) single and double armoured designs which include at the centre of the cable an optical core made of an hermetically sealed stainless steel tube which contains up to 48 single mode optical fibres. The optical fibres are placed loosely inside the tube with excess length and are surrounded by a filling compound (jelly) which includes an hydrogen scavenger. Over the optical core the successive protective layers are applied. The first composite power/optical fibre submarine cable was manufactured and installed by FULGOR in 1995. The construction of composite power / optical-fibre submarine cables is similar to that of standard submarine power cables, including additionally in their structure one or more optical units. The optical units are stranded during manufacturing of the cable between the outer interstices created by the insulated cores of the cable. For relevant short distances, multimode fibres may be used; with single mode fibres are used for long-distances. In 1972, FULGOR undertook its first turnkey project for the supply and installation of 20kV submarine power cables to interconnect several islands in the Aegean Sea on behalf of DEI (the Public Power Corporation of Greece). Since then, the company has used its own specialised assets, trained personnel and well-proven subcontractors and it has successfully completed a large number of turnkey projects mainly in Greece and in other European countries.